With the ushering in of global economy, more and more people find it necessary to travel more often for business reasons. There are people who travel with families to enjoy their annual vacation. Due to the spurt in air passengers, the airline industry is devising imaginative ways to improve their flight services. They are especially focusing on providing attractive benefits for the business class passengers. If you are a frequent flyer or a comfort-loving traveler or a traveler without budget constraints, you must seriously consider availing the business class flight as it holds an array of benefits. The business class seating allows you to stretch your legs and relax because of the wide space it offers. You need not bother about the passenger sitting in front of you when choosing to recline your chair. Depending on the airline, business class seats can vary in their recline angle from 140 degrees to 180 degrees. Most airlines provide business class passengers additional space to accommodate their excess luggage. This may be a boon for passengers who frequently travel carrying more luggage. The waiting hall/ passengers lounge for business class travelers are lot more convenient. For instance, some business class waiting areas offer shower and nap rooms, as also access to the internet and private eating areas. Even though business class flights may be more expensive, these types of additional amenities compensate for the extra money paid. Business people who fly have generally to travel long distances, reach new destinations, represent their company in the outer world. Flying is a tiring affair and the comforts of business class flights will make raveling less fatiguing. Business class flight passengers will receive priority while boarding and will be seated sooner than the herds of economy passengers. Similar courtesy will be extended to business class passengers while deplaning also. 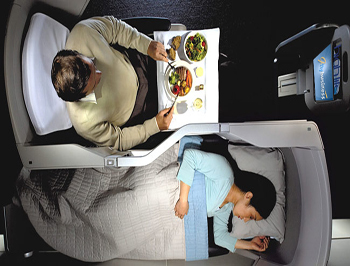 The business class flights offer a wider selection of food and entertainment. Drinks are generally free and you can order your food well in advance from a pre-order menu. One key benefit of being in business class flight is the excellent quality of food they serve. As regards entertainment, you can ask for a portable DVD player or avail the on-board audio/video systems. Since you are provided ample space in your seating area, you can plug in your laptop and access the internet or get a bit of your work done even while flying. Likewise, if you are travelling overseas, you be allowed to get into the first inline for fulfilling custom formalities. It can be a very tiring experience flying abroad and you will be travelling across different time zones. Business class flights will become more cost-effective as you will command better comforts. As you will suffer less fatigue you can arrive at your bend-destination quite refreshed and can even straightaway proceed for your meetings. If you are interested to experience business class flights, you may obtain information about all the benefits by visiting the airline website. Business class flights are costlier due to the services they offer. Nonetheless, you might at times find it difficult to book for business class flights due to its heavy demand.